Welcome to the Knight & Knerd locations thread! What is the beautiful Chinese or Japanese building at about 12 minutes into the Ep? Also, where is that lake at the start, where the father and daughter are fishing, and the attack starts. I thought it was in the Batcave area, but I don't think there is a lake up there in the Hills. I think the water falls at the beginning were on Universal Studios' backlot...I think that's where they filmed the waterfall scenes in "Not a Drop to Drink" as well. Yes I saw that sign too, as I have it on my TV right now (sadly cannot get a shot like you have done). The only way I think it can be trace, is via those building behind. However, this maybe similar to the fabled HOTRS shot - two locations, one shot! As the way it is filmed, they conveniently 'cut' between the two shorts, rather than pan across. 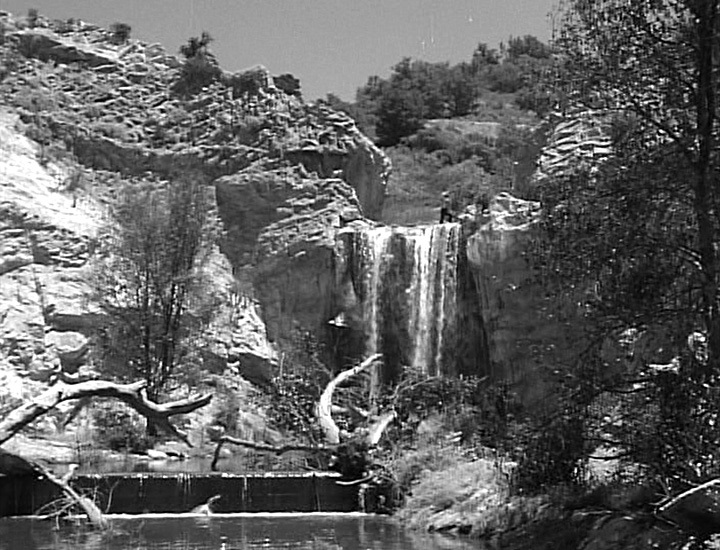 Incidentially, where is the waterfall used in 'Drop'? Tho a long time ago and Universal change their lots so many times, even the position of the Psycho House, that I wouldn't be surprised if it's long gone. Bingo, found the water falls from an old photo. Well I would, but it won't let me. Please add not a drop to drink with that detail. I found the Chinese temple! Even though the scene was cut, where Michael and KITT pull up is the same place as the temple. The Shell gas station is still even there! Good grief Joe, how on earth did you locate that? I can't see any clues there at all. I'm not a local (from the UK), so wouldn't be able to spot much. But I can't see anything there at all. I am going to watch that scene again, as on the DVD it looks like a huge place. The angles used. I guess that 'wall' behind the lady where you see MK's silohuette is where the gate is, so it blocks it and makes it look like a large place.